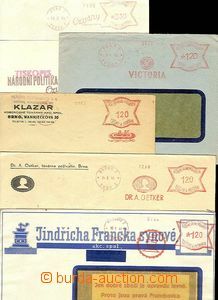 1939 Association Krematorium Prague - forerunner frankotype from 19.4.39 on/for small window envelope sent as printed matter 30h. Without damage. 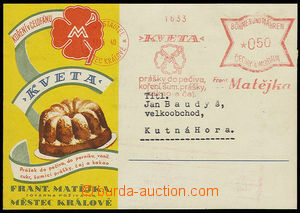 1940 advertising PC with color additional-printing, franked by meter stmp HRADEC KRÁLOVÉ / Fr. Matějka 17.5.40. Very decorative. 1941-43 comp. 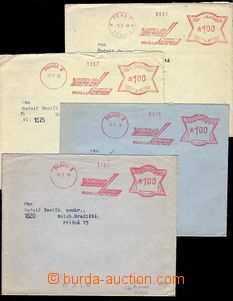 5 pcs of entires with print meter stmp, PARDUBICE Franck and sons/ 10.1.41, BRNO Dr. A. Oetker/ 24.5.41, BRNO AK (Klazar)/ 26.9.44, PRAGUE Victoria/ 17.4.43, PRAGUE National policy Ozvěny/ 15.5.44. Nice print. 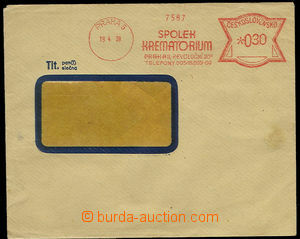 1944 envelope with additional-printing paid meter stmp LOMNICE N. P. Antonín. Jína/ 23.8.44. Very decorative!